Sterling Silver with Grey Cabinet. 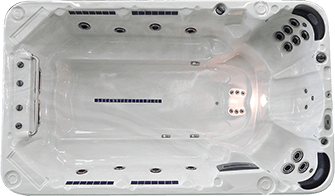 The original space saving and affordable swim spa and party pool featuring the Pro-Swim system and seating for 11. Midnight Canyon with Grey Cabinet. Midnight Canyon with Mocha Cabinet. Sterling Silver with a Pecan Cabinet.